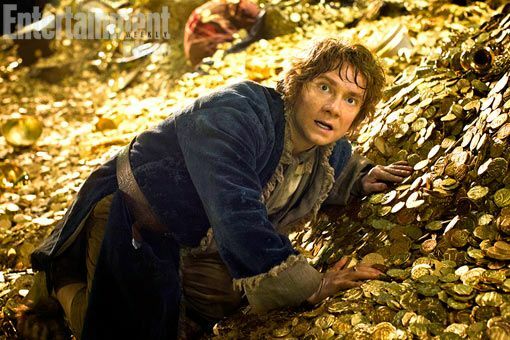 With only a week away before the first of The Hobbit trilogy begins with 'An Unexpected Journey,' EW has already teased 'The Desolation of Smaug' and 'There and Back Again' by releasing two still from the two sequels. “He’s [elven king] Thranduil’s son, and Thranduil is one of the characters in The Hobbit," said Peter Jackson. 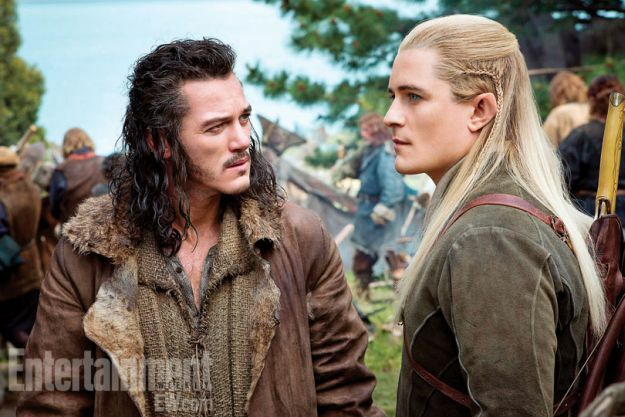 "And because elves are immortal it makes sense Legolas would be part of the sequence in the Woodland Realm." And what of Bard? "Bard is an interesting character, but [in the book] he’s kind of a random character who comes in after the fact," said writer/producer Philippa Boyens. "We take more time introducing him. We know from what follows that he was a father, so we [explore] that. I don’t think we take liberties, because it’s all there in the storytelling." The second still below, is from the second part of the trilogy 'The Desolation of Smaug' showing Martin Freeman’s Bilbo Baggins splayed out on a massive pile of treasure staring at the dragon Smaug. Interestingly the first two parts of the trilogy will cover the original text the film its based on with the third part with 120 pages of appendices Tolkien wrote to 'The Lord Of The Rings' that elaborate on the story and actually continues well past the face-off with Smaug at the Lonely Mountain, culminating eventually in the epic battle Battle of Five Armies, involving Laketown men, orcs, dwarves, goblins, elves, wargs, and giant eagles. 'The Hobbit: The Desolation of Smaug' will be released on December 13, 2013, and the final entry, 'The Hobbit: There and Back Again,' will be released on July 18, 2014.